US$ 4,975.- » CONTACT NOW! The Varzina river flows partly through a canyon and the pools are spectacular combined with fast flowing rapids, where you'll find Atlantic salmon (Salmo Salar) up to 25 lbs. The lodge is situated on a 14 km long stretch of water in between the upper trout-camp by lake Enozero and den Main salmon camp by close to the Barents Sea. This part of the river was seldom fished until the Camp was built a few years ago. 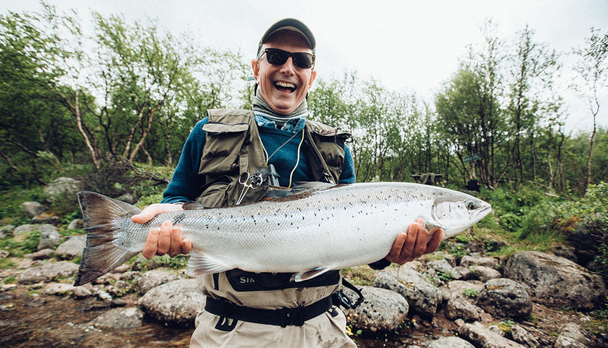 The river flows partly through a canyon and the pools are spectacular combined with fast flowing rapids, where you'll find Atlantic salmon (Salmo Salar) of up to 25 lbs. The only way to access the river is through hiking which is somewhat physically demanding. Varzina river is situated on the northern coast of the Kola peninsula and is approx. 30 km long. The only way to reach the camp is by a 45 min helicopter transfer from the town of Lovozero. 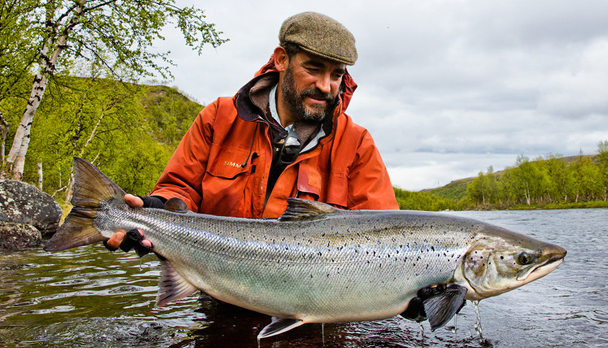 International guest will need a tourist visa, this can be arranged by the Russian embassy based on a written invitation from Sport Fish Tour/ Varzina River Company To get to the Kola peninsula you need to get a flight in to the town of Murmansk where staff from Sportfish Tour/ Varzina river will meet you. HORN JACK POOL: A series of good spots that stretches 2 km downstream the outflow of Nizkiy on top of the stretch. This part is not fished a lot and is particularly productive during later in the season. SWEEP: A wonderful, classic salmon pool with a steady stream of water, fishable even on low water conditions. BIG FALLS POOL: Place for the biggest waterfall in the Varzina system and the home for some really big trofy salmon. Good fishing from mid July. FILIPPOV OUTFLOW: Here is the camp, the outflow from lake Filippow forms the homepool for the lodge. This pool will hold fish from late June. CAMP POOL: Situated about 10 minutes walk downstream from the camp. Here starts the deep canyon, held as the most scenic part of the river. LONG WALK POOL: This is the end of the canyon and a highly productive pool throughout the season. BOULDERS POOL: As the name suggest it is filled with big rocks, tricky to fish but very productive. FINNPOOL: One of the best pools in the river, deep and often the home of realy big fish. The Camp lodge was built in the summer of 2014 and is situated by the deep canyon in the area right by the sheer cliff, hence the name. The camp is for 8 rods in 4 big army tents with heating and beds in double occupancy. There is a dining cabin with a kitchen, a shower cabin and toilet facilities. The camp provides breakfast, lunch and dinner with good quality. There is 220 V electricity, hot and cold water, satellite phone and a motorboat for crossing the river. The staff contains of a camp manager, guide, chef, ground staff. Doublehanded rod 13-15 feet not lower than #8-9 + spare rod. Medium size reel with a good break containing 30-50 lb backing min. 150 m.
Floating line + Sinktip lines (Type Rio Variotip / int ? s3, s6, s8). Waders + Wading boots (remember that they need to be good to walk in, felt soles can be very slippery). A Simms Vapor boot with rubber-sole and cleats is ideal. Flies: Bombers/Foamflies in size 2-6, Sunrays, Golden Killer, Phatakorva type tubes, Willy Gun , Collie Dog , Sunray Shadow" . Also different flies of green&black and yellow&black colors. The river is very clear, most flies should be thin and with less material (There are some flies at the camp). 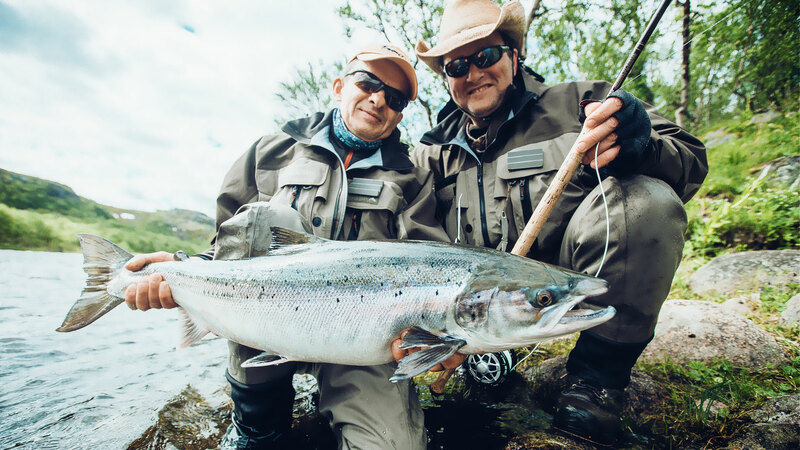 Rates include: Meet and greet at Murmansk airport, a night accommodation in Murmansk, ground transport to/from Lovozero/helicopter, 7 night accommodation and 6 full fishing days, All meals + non alcoholic drinks, one guide each two anglers, fishing permits. Rates do not include: International flights / domestic flights to Murmansk. Alcoholic beverages, cost of visa, travel insurance (we suggest Golbal Rescue), other extras. Fishing equipment and flies. Notes: The package includes the tips, but we always suggest an extra tip for the guide and Lodge staff. In case the guide is NOT required, the rate has a significant discount (consult). Finally burning heat of Kola fell back and let us enjoy all the advantages of salmon fishing! During the whole week weather was cloudy and chilly. Since 04.08 till 11.08 Cliffhanger Lodge on Varzina river received a group of very experienced fishermen from Finland. It has been said that work goes as a swing under the master�s hand! Guests bindingly and expertly addressed the issue of low water. By trial and error they found the right flies and were rewarded with great number of bites. The most working fly was Surf Board made on white foam with silver flash body. Sunray Shadow was also very productive. This week fish was again between 5-8 kilos, 6 salmon was over 90cm. Total fishing results of the week pleased not only with sizes but also with number: 96 salmon! Great result for this time of the season. Water level stays very low, water temperature reached 14C by the end of the week. Looking forward to meeting the next group of guests and hope to get great results again!